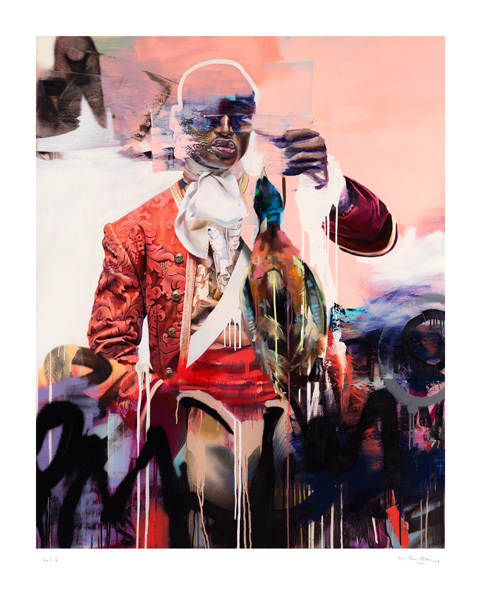 Conor Harrington’s spectacular, sold-out Spring 2012 show Dead Meat depicted a fantastical, imaginary feast representing the decadent collapse of European hegemony. The young Irish painter combined Neo-classicism and the graffiti art of his roots to produce a momentous body of work, internationally lauded for its skill, opulence, imagination and eloquence. Exhibited at Lazarides Rathbone gallery, Dead Meat saw Harrington join the very select band of former graffiti artists who have successfully negotiated the crux to ‘high art’ status. The Modern Monarchy print inspired by Dead Meat follows the runaway success of Harrington’s When We Were Kings edition earlier this month. Made at Lazarides dedicated Execution Dock studio, each boasts hand-applied gold leaf flourishes (on the buttons of the subject's frock coat) and is finished with a silk screen gloss. Modern Monarchy will be available from 16:00 BST (that’s 08:00 on the west coast of the USA, 11:00 on the east coast and 17:00 on continental Europe) Thursday 19th April 2012 at The Outsiders.